Enrolling in RCU Online Banking is quick and easy! All you need is a savings share and your Member information. Please visit our home page at www.redwoodcu.org. On the left hand side of our webpage you will see “Welcome to RCU Online". Find and select the Enroll Now link (see screen shot image below). There is also login help under the Help & Options link. Once complete, type the word YES to accept the Terms of Service and Electronic Signature Disclosure. 3. Select three security questions and enter the answer to each. Online banking allows joint accounts to register a username and password for the joint account holder to access account information. If you are a joint account holder on the account you must make sure the primary account holder is registered before you register the joint Member. If you are registering as a joint account holder you need to use your social security number and birthday. Do not use the primary account holder's social security number and birthday information. If you get a message that this user has already been registered, check to make sure you are using your own information. If you continue to have login issues please contact our Member Service Center at 1-800-479-7928. Besides going into a branch, how can I access my account? I made a Visa payment online, but my online statement still says a payment is due this month. Why is that? 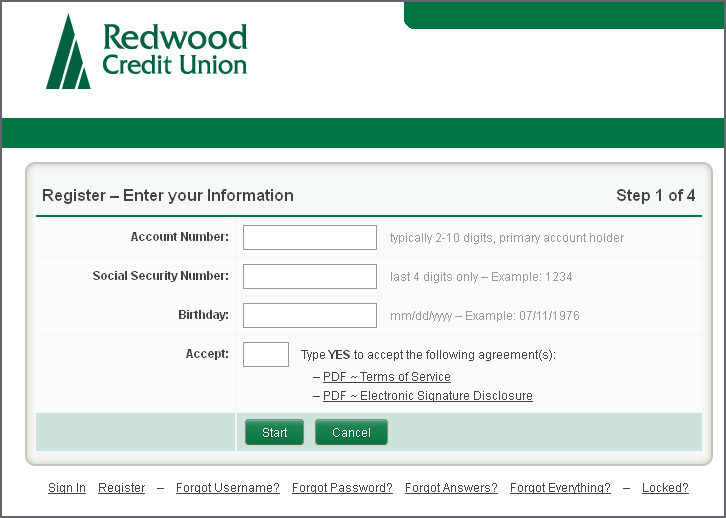 How do I change my RCU Online banking password? What account number should I use to initiate a direct deposit or electronic debit to my checking account? What account number should I use to initiate a direct deposit or electronic debit to my savings account? How do I balance my account? If I am an RCU Member, which of my family members qualifies to join the Credit Union? Can I share my Online Banking access with my accountant or partner? How can I check my account balance in the RCU Online banking? In Online Banking, when I view Transaction History, is there a "Print" button on the page? Can I use Mobile Banking if I don't have access to my accounts through RCU Online banking? How can I check if my Direct Deposit was posted to my account in RCU Online banking? How can I make a loan payment in RCU Online banking?